I have been spent a fair amount of time evaluating hip protectors for osteoporosis clients. In this video I talk to the CEO of Impact Active Hip Protectors — one of the leading hip protectors for osteoporosis — and discuss a recent study on their performance. Natasha Williams is the CEO of Impact Active Hip Protectors International. Impact Active produces high quality hip protectors for people with osteoporosis, osteopenia and low bone density. I interviewed Natasha at The National Osteoporosis Foundation meeting in New Orleans and asked her about Impact Active Impactwear hip protectors. Margaret Martin: Hi, I’m Margaret Martin at MelioGuide, and today at the N.O.F. Conference in New Orleans, I have the great opportunity of meeting Natasha, who is C.E.O. and the inventor of Impactwear — makers of Impact Active hip protectors. 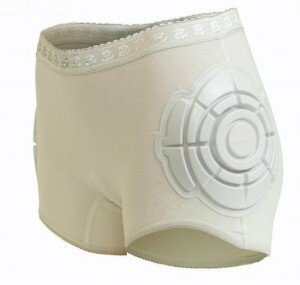 I am really excited about Impact Active hip protectors, because we see compression shorts in one category and then we see hip protectors as a category. These hip protectors, we always kind of relate them with people in nursing homes. But the pair that you kindly gave to me at the conference today, I wore around New Orleans today and they weren’t overheating me. They were actually really comfortable. I thought, “Wow, if I was going to take up rollerblading, I’d put them on”. If you don’t mind sharing a little bit of the story of how you came about creating Impact Active hip protectors. Yes, absolutely. I bought a traditional hip protector company about five years ago. You’re right, very much nursing home, frail, elderly who absolutely need hip protection. But what we recognized is vastly growing population of active seniors who are still living independently, still want to live independently, but don’t want to put on something that’s bulky or hard or uncomfortable or ineffective, which is really where hip protectors sit. So I had a traditional hip protector looked at all the things that were happening with the aging population with osteoporosis and osteopenia and looked at what are the issues with hip protectors. We all know they work because a lot of research out there confirming that they prevent hip fractures, but what the issue is if they’re not being worn, they don’t work. I set about looking for advanced material technology that could obviously perform because it’s key. But it meets all those compliance issues, so soft, light, flexible, comfortable, virtually visible under clothing. I found an amazing company here in the U.S. who was developing an advanced material for the exact same reasons that sports protection for extreme sports in young people was difficult or hard or bulky, and they developed this material which, as you said, is incredibly soft, lightweight, flexible. It just wraps around your body. It’s very slim. It’s advanced and that it works on a molecular level. So on impact, the material instantly hardened just for that moment of impact. It attenuates incredibly high levels of force. But as soon as the impact is removed, it immediately becomes soft, light and flexible. It doesn’t degrade over time or repeated impacts. The great thing about garments, now this is the main style. We like to say “ordinary underwear for active seniors”. We’ve got a women’s, we’ve got a men’s. So Natasha, just a couple because we need to wrap this up. Initially, when I saw the material, I was a little concerned in terms of washing. You said no issues especially if this guy is wearing it while surfing. Yes. Look, one of the compliance issues is very much obviously you’ve got the comfort and all that, but one of the issues is simple, how to keep it clean, how do we use it every day but still be able to wash it? The shields are sewn in, so they can’t be removed. They’re not going to get lost. You go through the washing machine and dry like any other normal clothing, a hot wash and a hot dryer. It’s 95% cotton, 5% elastic, so it’s incredibly soft, light and comfortable. Like you say, you’re not going to overheat in it but it really is as simple as any other pair of underwear or underclothing that you’re wearing. Chuck it in the washer at the end of the day, chuck it in the dryer, and yeah there’s no problem. It’s really easy. How Effective are Impact Active Hip Protectors? All right. On your site, is there a really cool video of the study you did? So, yes. Have a look on the website. We took a wine bottle, which everybody knows is incredibly fragile. Then we took a 10.5-pound bowling ball, and dropped the bowling ball on the wine bottle from about six feet. After that we put the Impact Active hip protectors shield in place, and the wine bottle was protected. When we removed the shield, and it obviously smashed. It’s a really nice way for people to understand this is fragile, it smashes, the shield takes all that impact away. Yes, it’s a great demonstration. Thanks very much for the opportunity to share this information with the listeners. Hip protectors can reduce the risk of fracture from a fall. I have discussed Posey hip protectors in an earlier blog article. Dr. Fabio Feldman, Manager of Seniors Falls Prevention at Fraser Heath and Adjunct Professor at Simon Fraser University, gave a webinar in which he reviewed his study on hip protectors effectiveness. Dr. Feldman and his team conducted biomechanical testing of twenty-five different hip protectors using a hip impact simulator. The best performing hip protectors in Dr. Feldman’s study were from HipEase, HIPS, Pelican Super Soft, and KPH. The performance of the various protectors is listed in the pdf. The Impactwear scored the lowest of all those tested. However, please note that the study was done using an older version of their product, not the new one discussed during the interview with Impactwear’s CEO (see below). Also, of special interest is the development by Dr. Feldman and his team of adhesive hip protectors. We’ll be sure to keep you posted when they are ready for testing with active adults! Hi, I’m Margaret Martin from MelioGuide, and today I want to talk to you about an important topic, and that’s fall. I would like to experience only the positive type of fall and that is the one that comes with changing colors, but, unfortunately, many of you were concerned about and will experience the other kind of fall, the fall that can dramatically change your life, your quality of life. It’s imperative that you protect your bones. Both exercise, balanced training, flexibility training, all of these things we know has an impact on protecting you from a fall. But there’s another way of protecting yourself and hip protectors is one means that you can use to protect the really important bones of your body, your hips. Fabio Feldman, an associate out of Simon Fraser University, did some great work looking at different hip protectors and how they can effectively protect you. I’ve listed some of the top hip protectors that are out there for you to consider using on the market. You might notice on the graph that’s provided by Fabio in his study in 2012 that one of the hip protectors I discuss below, Impactwear , shows that it actually increased your risk for a fracture. But that was before they changed their design and went with this soft shell technology. I tell you if you fracture your hip, you’re going to be a lot more obvious than what you’d look like just wearing hip protectors. So I encourage you to protect yourself through continued exercise, balanced training, as well as wearing hip protectors. That’s all from MelioGuide today. Thanks for tuning in. Thanks for the information! I’ve been experiencing some pain in my hips after I found out that I have osteoporosis. I used to just have pain in my hands, but it spread to my hips within the past couple of months. I’m nervous that I’ll hurt myself if I bump my hip against something, so it seems like I should look into protective gear. You made an interesting point about how the right protective gear can reduce my risk of fracture from a fall. It seems like I should start looking for the right hip protector for me in case I fall and fracture something. My doctor recommend me to do biking for exercice but my hip’s bone density shows a t-score -1.5 and z-score of -0.4. It shows evidence of bone mineral loss at the left femoral neck. I got also a mild spondylolysis disc space narrowing at l3-l4, l4-l5, l5-s1 plus a mild degenerative changes in the facet joint at l4-l5 and l5-s1. Would hip protector be a solution for me so that I can go back on a bike again? Apparently bike is only choice besides walking and swimming. There is no pool in my own area to practice the latter exercice. I would rather see you walk than bike for the health of your bones biking is not helpful. You can supplement with it but do not only bike. Yes hip protectors are great. Some of my clients wear bike shorts with protective shields built in like the crazy off road bikers wear. As for walking you can consider using poles (Nordic Poling). The poles take some of the load off of your back and will keep you tall. It also helps with buiding core strength that helps with the Spondylolysis.